Today marks the launch of DVLA’s Information Systems Business Analysis Development Programme. It is a great opportunity to grow in-house talent that allows us to progress with our digital transformation. We are at the forefront of public digital services. Last year alone we reached a record-breaking one billion interactions with our customers with over 90% online. Our IT Strategy outlines how we will transform our services to the public over the coming years. We will respond to new technologies (such as cloud computing) and also once in a lifetime changes in transport technology such as the move to self-driving vehicles. Business Analysis will be crucial in ensuring we make these goals a reality. 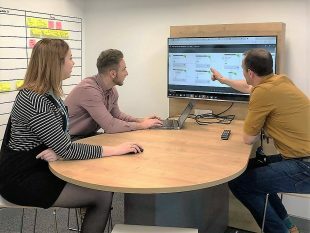 We use Business Analysts (BAs) in all our digital projects, working closely with software engineers to put in place award-winning services for our customers. BAs also have an important role in talking to our stakeholders. They make sure we understand the outcomes stakeholders want to achieve and advise how we can provide it in the most efficient way. Business analysis is a great introduction to a career in the IT sector, with plenty of opportunities to become professionally recognised and to have continuous professional development. Our BAs have a community that shares best practice and offers a strong support network. They have become a reference point for other government departments who are looking to match the development structure we have put in place. So, if you have an interest in IT, enjoy solving problems, can stay calm under pressure and are committed to your development we would definitely like to talk to you. What would the programme give you? You would also be given a personal mentor to help you through your time. But perhaps more importantly, it would give you the chance to gain experience working on some of the most important digital services within government, putting into practice your learning in a real world environment. We have 10 positions available on our Programme. They run for 24 months with a salary of £25k, giving you the opportunity to earn while you learn. It offers a real alternative to some of the more traditional routes, such as university. To find out more about the roles, entry requirements and application process follow the link on our current vacancies page.